NEW L'ÉLIXIR DE PURETÉ, Red Label (oxygenating & anti-pollution serum) When only the Finest will do! Experience one of the Finest serum in the luxury green beauty world. For the true connoisseur only. This innovative, all-natural, plants-based serum is packed with high-performance active ingredients that provide multi-targeted benefits and increase moisture. A soft, lightweight water-based serum filled with a special combination of ingredients that protect against pollutants and promote skin oxygenation for a fresher complexion and more invigorated skin. Uncover Okoko Cosmétiques new gel-to-milk mask elevates cleansing to a luxurious and nourishing ritual. This innovative Dragon's Blood infused oily emulsion effortlessly melts away makeup and impurities, then transforms into milk upon contact with water, to hydrate and illuminate the complexion. Made with Dragon's Blood extract, squalane, calming blue tansy, and papaya enzyme the silky formula nourishes skin, leaving it smooth, soft, clean and comfortable. 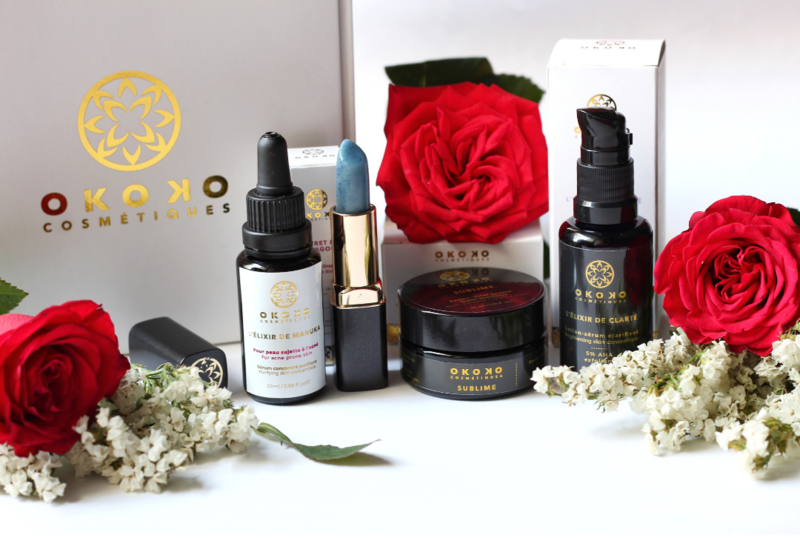 Secret Du Dragon lip treatment/serum has a potent and concentrated nourishing formula made with healing ingredients, calming blue tansy, rare and precious tomato oil, anti-aging ceramides and soothing bisabolol, to calm, repair, condition, and transform dry, chapped lips. The lip treatment instantly softens roughness, nourishes, and helps soothe serious dryness. Lips stay hydrated and protected all day long, making your lips look natural on their own. It also acts as a primer for any color application. skin. Fermented willow bark maximizes skin hydration, and reduces inflammation and the appearance of breakouts. Now with a beautiful whipped texture and a delicious vanilla scent… Sublime is a brilliant multi-purpose radiance balm for various issues associated with dry and dehydrated skin. Made with rare and precious tomato oil (rich in lycopene), fermented willow bark, youth-enhancing argan oil, pomegranate sterols seabuckthorn co2 and calendula co2. Using Sublime Balm in your skincare routine will yield fantastic results: hydrating, soothing, smoothing, and rejuvenating. serum made of organic oils and enriched with effective, research-backed ingredients that help skin prone to blemishes. One of the star ingredient is manuka active concentrate. skin’s defenses against the impact of environmental assault. A perfect indulgence after a long tiring day and when all you want to do is - unwind with a deep cleansing session! This rich, decadent facial treatment works to deep cleanse, purify, rejuvenate and revitalize, bringing a new, glowing radiance to your skin. L’ÉLIXIR DE CLARTÉ (The Radiance Elixir) is a weightless, fast absorbing serum formulated with organic aloe vera and powerful active ingredients to impart radiance and a healthy glowing complexion. This concentrated yet gentle concoction is made with 5% alpha hydroxyl acids (AHA), naturally sourced from blueberries, sugar cane and citrus, combined with natural plant extracts and soothing algae to gently exfoliate your skin. Our treatment bowls are now back in stock with a new look and infused with gold! This elegant, handmade treatment bowl is a great addition to your facial experience and an amazing decoration for your home. It is perfect for blending LA BOUE DE BEAUTÉ or LA D'TOX NOIREface masks and adds a sense of comfort and luxury to your skin renewal. Each creation is truly a piece of art and hand signed by the artist. Have you ever tried a soothing, brightening clay mask infused with exquisite macadamia oil to moisturize and carefully selected essential oils with a soothing and refreshing aroma? This silky beauty mud is a powerhouse blend of 23 active ingredients that will help lift impurities and revitalize dull skin. LA BOUE DE BEAUTÉ (the beauty mud)is a gentle face mask and scrub that works to brighten, soften, exfoliate, and refine skin leaving it clear, smooth and more evenly toned. What’s more this mask allows a better penetration of your precious serums and actives to follow which will be better absorbed and utilized. moisturizing balms, beauty oils and rare elixirs to attend to your most important skincare needs like acne scars, hydration and anti-aging. The products are decadent yet luxurious, and a good way to decompress at the end of a long week . texture this oil-free, expertly blended soothing elixir helps skin recover from the effects of today's busy lives. It reduces the appearance of skin imperfections, hydrates and has a firming effect. We are delighted to introduce OKOKO mini-kit, for you to try and love our wonderful products. It includes all 6 OKOKO products for you to try and ensure skin compatibility. Enjoy as you beautify and relax. Allow yourself to feel completely at ease and rejuvenated. Both face masks in the mini-kit can be used 2-3 times and travel size of our face oil will last you a couple weeks (a little bit goes along the way). This high quality treatment brush made with wood and soft synthetic bristle is a great addition to your facial experience. It works well with any liquid or cream formulation and it's very soft and gentle on the skin.